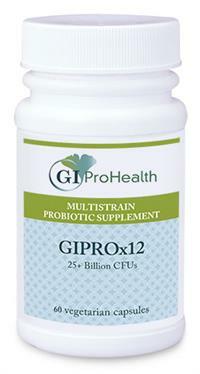 A Non Dairy maximum-support probiotic formula. (NOT SCD Legal) This high-potency, hypoallergenic blend of 12 certified probiotic species offers the most complete spectrum of microorganisms in the GI ProHealth line. GIPROx12™is a complete unique combination of colonizing and transient strains providing broad coverage to support a healthy balance of microflora across the entire gastrointestinal tract. Scientifically formulated with a full spectrum of synergistic and complementary species, GIPROx12™ is designed for individuals who require significantly higher amounts of several different types of probiotic species to help support intestinal health. Formulated with 25+ billion CFUs per capsule, GIPROx12™ uses a proprietary technology to ensure maximum delivery of live microorganisms throughout the intestinal tract.